Digital accessibility is often thought about in terms of standards, testing and regulations. Structured Negotiations, an alternative dispute resolution process that has been used for over fifteen years to make websites more accessible, is a legal strategy and involves lawyers. But these descriptions leave out perhaps the most important component of both accessibility and Structured Negotiations: people. People with disabilities who use websites, rely on mobile applications and are willing to advocate to protect their civil right to access digital content. Becky Griffith, who died earlier this month at the too-young age of 44, was one of those people. Becky was a claimant in successful Structured Negotiations with Safeway grocery chain. (A Structured Negotiations claimant is the equivalent of a plaintiff in a lawsuit. We use different terminology to emphasize that Structured Negotiations is a collaborative, not an adversarial process.) The Safeway effort convinced the company to upgrade its online grocery shopping site to satisfy the Web Content Accessibility Guidelines 2.0 Level AA so blind people (and everyone else) can use it. Later, we also worked with the company to ensure that all its mobile applications are accessible. Before Structured Negotiations Safeway had a separate-and-unequal text only site that it called the “Access Site.” In the agreement that resolved the case, Safeway agreed to take down the separate website (which didn’t have all the features — including coupons and sales — of the main site. Read the post about Safeway taking down the separate site. But Becky knew that announcing a settlement agreement is not the end of advocacy. She steadfastly kept me updated about changes to the site, including inadvertent slips when new content wasn’t usable. Less than a month before she died of complications from diabetes she and I were emailing about an accessibility bug in the company’s coupon offerings. Becky patiently worked with Safeway staff until they recognized the problem and committed to fix it. Her last email to me reflected the kindness from Becky I felt in all my interactions with her — she was gracious despite Safeway’s mistakes, and appreciative of the work Linda Dardarian and I did to improve Safeway’s website. Griffith was an accomplished home cook who had been blind since her late twenties. While sighted people are sometimes surprised to hear that blind people cook, Griffith didn’t think her kitchen skills were any different because she happened to be blind. “I guess you’d call me a foodie,” she told me when I interviewed her for my book-in-progress about Structured Negotiations. “I spend a lot of time in the kitchen experimenting with recipes and figuring out how to do things without sight,” she said. Griffith preferred to go to the market herself, but still relied heavily, week in and week out, on the Safeway website. Before leaving the house, she went online to study nutritional information, serving sizes, product choices and cost. Mindful of her weekly budget, Griffith wanted to know the exact item, size and price that met her family’s needs. She would print out her shopping list to show store staff exactly what she wanted. Griffith was one of six blind Safeway shoppers who served as claimants in the Structured Negotiations that changed the policies and practices of one of the largest grocery chains in the country. What makes a great advocate? Becky lived with her husband and fellow accessibility advocate Gabe Griffith, who is also blind. The couple met in 2002 while attending California State University, Sacramento. Together they were active in the California Council of the Blind and could be counted on to do the ground work that makes Structured Negotiations an effective advocacy method. An avid baseball fan, Gabe was always available to give feedback to Major League Baseball as it worked through accessibility issues early in our Structured Negotiations over the website and mobile applications of MLB and its thirty teams. And when we needed someone to give usability feedback on a retailer’s new point of sale devices, Becky and Gabe volunteered their time, went to corporate headquarters, and provided invaluable comments. In doing this work Becky (and Gabe too) exhibited the qualities that make a great advocate. Becky was patient and understood that lasting change takes time. She was not afraid to speak up when something was not working as it should. Becky shared information with candor and kindness, did not need to raise her voice to make herself heard. She knew that praising companies for what they do right does not detract from strong advocacy to change what needs improvement. And Becky was concerned with the big picture, caring not just about herself, but about how all blind people would use the Safeway website. 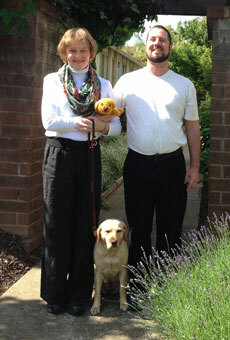 Becky Griffith was a valuable member of the blind community and a valued Structured Negotiations participant. I will miss her. Next Next: Humana Talking Prescription Label and Accessible Information Settlement Agreement.